He's not really nasty, but by golly he looked a bit purposeful this morning. Reminds me terribly of a sad little man we encountered on Monday. For the first time in my thus far illustrious career that I've actually been thrown out of a consultant's office. I was, after all only trying to give him a job for which as it turns out he'd quoted more than double the going rate. After a few short minutes of discussion during which time he took exception to me daring to ask about his methodology, we were shown the door. I can only assume that vulnerable people inexperienced in the property industry are simply led on a merry chase. For his part, well perhaps he would have received us differently had he bothered to question my credentials as well! I'm rather glad he didn't. For the technically curious, yes our seagull was in a hurry, and yes it took a few shots at 1/80 sec to get his head reasonably sharp with his legs moving! I like the metaphors ... and the partial stories. You taught me with portraits that it is powerful to cut bits off - even foreheads! I like your stories that tell us just a smidgin of the red-tape and process that you are both enduring. Hah ... my WV is "nuterd"
Is a WV a VW driven backwards? 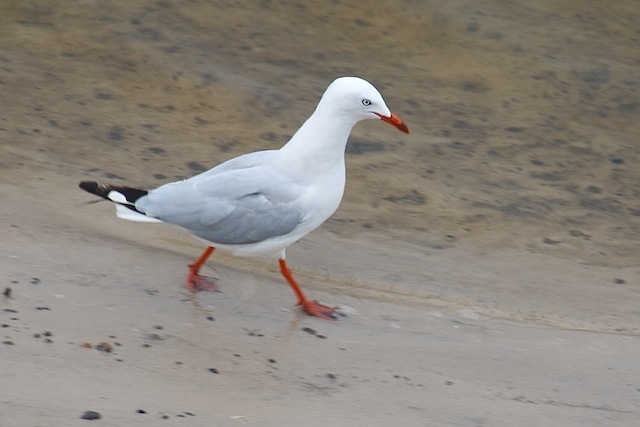 Just wanted to let you know that this seagull counts ... because of the busy legs.